Being a mum is a full time job and when it comes to Mother's Day it's lovely to be treated to something special that shows real appreciation. Whether that's in the form of a hand made card from the kids, a pretty bouquet of flowers complete with chocolates or just a night away from the kitchen and cooking - it makes us feel loved by our little ones. However, if you are after a gift with a touch of elegance this March, a wonderful keepsake, look no further than Cavendish French. They have a stunning silver jewellery collection with something to suit everyone - from the timeless and classic to bold contemporary statement pieces, and everything in between. They offer luxurious yet affordable pieces in their unique collection which comes from all over the world, and features designs you simply won’t find in any high street store. A variety of their items in the stylish range incorporates striking natural semi-precious gemstones and mesmerising crystals. 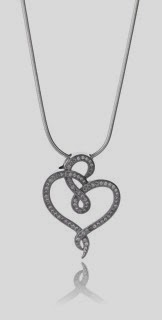 This includes the Never-ending Love Silver Necklace which is set with sparkling cubic zirconias, to create a beautiful and modern heart pendant. With Mother’s Day coming up, it’s the perfect time to make someone feel loved with something they can wear everyday or simply at those special occasions... of course it’s always a great time to treat yourself too! For your chance to win the Never-ending Love Silver Necklace worth over £60 you can enter via the Rafflecopter entry form below. The giveaway closes on 23rd March 2014. Holly Willowby - because she is just like 'us'! i'm really liking Peter Andre's girlfriend Emily at the moment. i'm following by pinterest and bloglovin as asked for by the rc plus other social media. Kim Kardashian - she always looks so glam and has lost so much weight since the birth :) I'm following on Pinterest and Bloglovin and Facebook as Natalie White, and @NatalieWhite91 on Twitter. I commented on your blog post recipe for Stained Glass Heart Cookies. Like Holly Willoughby, love how she juggles being a mum and a celebrity. Alyssa Milano, she has a fashion line, cares about others and acts as well. Avery busy and awesome celebrity mum. Angelina Jolie. Still has a career when she wants to but also happy to just be a loving wife & mother, even to adopted children. Special. Holly Willoughby - With everything she does, its amazing how she copes. I kind of like the celebs that don't use their kids as an accessory and just quietly go about being a mum so Emma Thomson I suppose. I don't really like celeb Mums - but Victoria Beckham seems to keep things sensible for her children. Holly Willoughby she doesnt use her children as accessories like most celeb mums. Jools Oliver - I read her book when I found out I was pregnant and it helped me so much! Angelina Jolie - she does so much for her children, inspiring them to take up charitable acts in the future to emulate her. Great role model for them. sorry but I do not find celebrity mums inspiring, they do not live in the real world! June Brown ( Dot Cotton) She hasn't had it easy but you can tell her children adore her. Sophie Ellis Bextor - she's continued with the career she loves while keeping her children out of the limelight and without using them to further herself. Has to be Angelina Jolie, mother, movie star, humanitarian. Kate Winslet or Holly Willoughby. I think Angelina Jolie does a great job. i dont really follow celeb mums. However i think katie piper will be a great mum to her child when they arrive. Holly Willoughby, seems nice, down to earth and a good mum and holding down a successful career at the same time ! I feel that all Mothers are amazing! Celebs or not.